Hello everyone, today I’d be happy to announce that ForeUI V1.50 is released! In the “General” section of the settings, you can change the look and feel of ForeUI. We use EaSynth look and feel (the bronze-coloured style) as the default look and feel, someone like it, and some one hate it. The reason that we don’t use the native look and feel is to avoid mixing up the editing content (with high fidelity) and the tool itself. Now we provide the options to switch the look and feel so users can pick the one they like. There is an option that allow you to input the class name of the look and feel, it is not so useful to most users. If you want to use the Java metal look and feel, you can input the “javax.swing.plaf.metal.MetalLookAndFeel” here to see the result. Another interesting update is the element library supporting (requested by Ari). Now you can define your own library for customized elements. This can help you to manage large number of customized elements. In the future, we will also allow upload/download/share the libraries via internet. You can switch the current library from the drop-down list, you can also regard it as a filter – only list the elements with the current library. If you choose the “All” library, all elements will be listed no matter which library it belongs to; If you choose the “Default” library, all elements that are not assigned to a library will be listed. You can click the button with icon on the customized element to move it to a library. From V1.50, the border of Text Edit Box element can be hidden, this feature is requested by Ulrich Böttger. With this new feature, you can make your own customized text input field (with special border). Another basic event “Right Clicked” is supported in V1.50, thus you can handle the mouse right click on any element. For example, you can handle this event and show the context menu on a window element. Add cut/copy/paste/delete items to edit menu. The plot property bar on bottom will become scrollable when window isn’t wide enough. 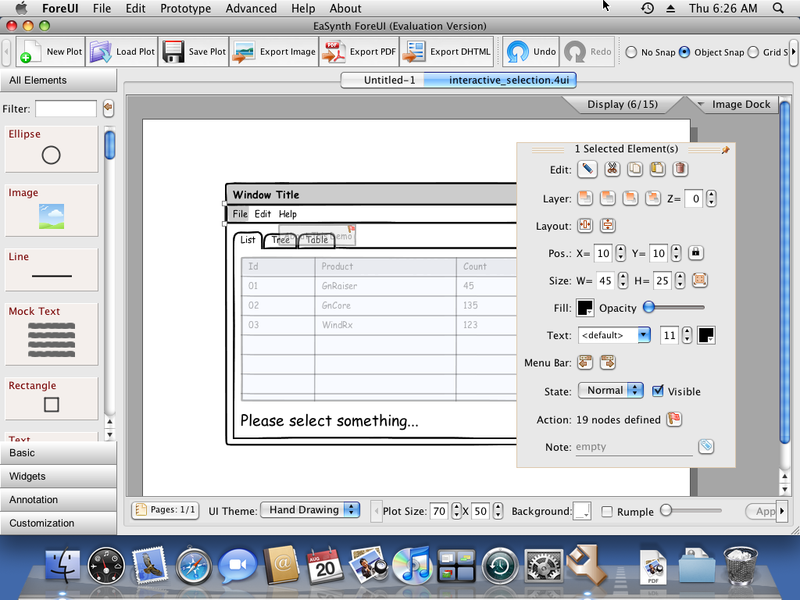 Behavior editor toolbar will become scrollable when dialog isn’t wide enough. Bug_0074: The thumbnail of customized element with single component will be too tall. Bug_0079: Text label has extra margin in simulation. Bug_0080: Incorrect text margin of Text Edit Box in simulation. Bug_0081: PDF export: Generate 2 pages PDF for single page plot. Bug_0082: Change the state of non-selectable element will cause JS exception during simulation. ViVi just finished a quick tutorial on how to make working prototype, the example inside may be too simple to advanced users but really useful to beginners. So, if you are new user of ForeUI and want to create interactive mockups, please don’t miss this totorial. One interesting new feature is to allow creating your own element library (requested by Ari), that will ease the management of customized element. We also have a plan to allow sharing libraries via internet. The Bug_0079 reported by Ulrich Böttger will be fixed, also we will fix another similar bug on Text Edit Box. There will be many other updates, but I can not disclose here. I don’t like to keep you guessing, but those things are not confirmed yet, so let’s wait and see :). Today we have good news: ForeUI V1.45 is released! It is kind of big update so the V1.42 is skipped. There are many interesting updates within this version and I will introduce them one by one. This element is required for a while, we understand it is very useful for prototyping so it is the first heavy-weight element to be implemented. It provides the possibility to mockup a calendar with any look and feel, and the calendar is fully functional during simulation, and we can handle its event and read/write its value. As you can see in the figure above, all colors of the calendar are configurable. You can also double-click the calendar to change its current date. The calendar element will fire a “Calendar Date Changed” event when its current date is changed during the simulation, we can handle this event to do many interesting things. There are two new actions designed for calendar element, one is to set the current date of calendar (format: yyyy-MM-dd); the other one is to triger the “Calendar Date Changed” event, thus it can invoke the event handler. The first action can change the date of calendar but it will not fire the “Calendar Date Changed” event. This feature is required bNow we can pick color from screen pixels with the new eye dropper tool, it will be activated when we click the color picker button. Now elements that has action defined will show an indicator (small red flag) on its top right corner. If you click the indicator, the behavior editor will popup and you can edit the actions immediately. We’ve added border color and border thickness options for rectangle, ellipse and triangle elements. We also added arc radius parameter to customize rounded corners. Previously we handled event on element level, now we have one more option: handle event on page level. We can define the event handler for the whole page, although we only provide a “Page Loaded” event at this time. We can edit the action for page from the page management window (see figure above). The button with red flag icon can bring up the action editor. The page with action defined will also have a small indicator on its icon. 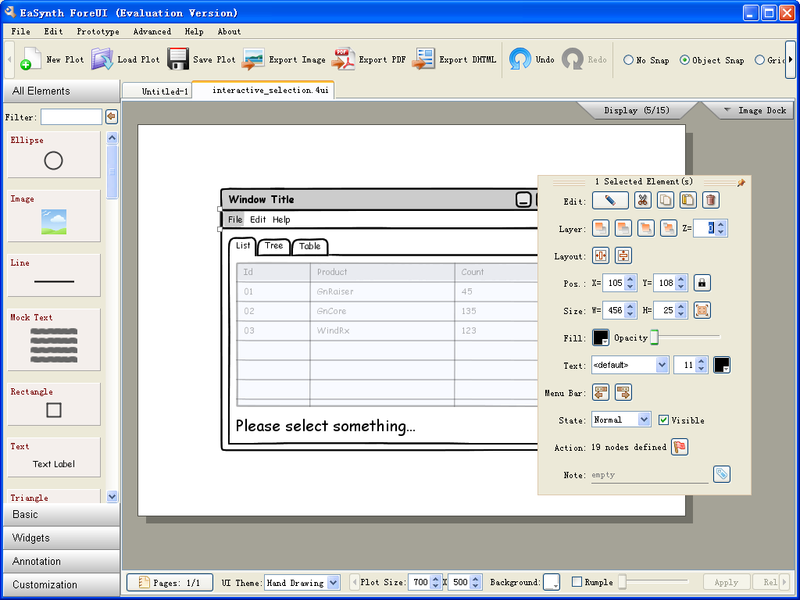 It can be used to collect date during simulation, it use calendar element inside. calendar.4ui: A three page demo, demonstrate the way to use calendar and date picker. You can click here to run its DHTML version. page_actions.4ui: It demonstrate the usage of “Page Loaded” event. You can click here to run its DHTML version. There are many updates in this version, I can’t write them all since I don’t want this post to be too long, so I will just list them here.